There is absolutely nothing good about a teenage girl dying as a result of an allergic reaction. But the massive coverage resulting from the inquest into Natasha’s death has at least brought the issue of severe allergies to the forefront of everyone’s minds – and that is good. However, what is totally not good is that Natasha only died because Pret was (and is still) stretching the 2014 Food Regulations to a place where they were never intended to go. For years now, all packaged foods sold through retail outlets have had to carry full ingredients labelling. 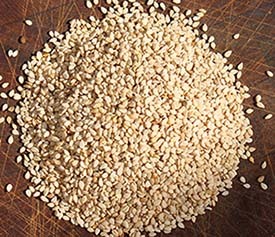 This includes having any of the 14 major allergens that they contain (of which sesame is one) highlighted in bold or italics. However, in 2014 the regulations were expanded to cover all foods sold loose, without packaging, foods that are wrapped on site and all foods sold through the food service industry whether in a works canteen, a five star restaurant, a hospital, a school, a café or a stand at a football ground. While the bigger operators were able to incorporate allergen/ingredient information into their systems relatively easily it was realised from the start that requiring that small operators (who make up the majority of the food service industry) should ingredient label every single item they sold would be so onerous a burden that it would effectively put many of them out of business. A compromise solution was therefore adopted, exempting small outlets from labelling every item of food and allowing them to use fridge stickers, notices or word of mouth to tell customers about allergens. While viable, this solution was always going to be risky as it depended on those outlets understanding the dangers their food might present for allergic customers and being diligent in communicating that danger. When most of the food is made in front of the customer as it is in most small cafés, that is probably just about workable. However, extending that exemption to a chain that served thousands of products that were most emphatically not made in front of the customer was ludicrous. Stickers on fridges or notices to ‘ask the staff about allergens’ in a heaving high street Pret outlet were never going to provide the kind of reliable information that allergic customers need. Pret sandwiches and baguettes are, in effect, retail products and should carry full ingredients labelling as would any other retail product. Inexcusably, Pret made used of this loophole, presumably to save themselves the cost of labelling their products. The ‘artisan baguette’ that killed Natasha included sesame seeds in the dough. Not sesame on the outside the baguette which would at least have been visible to the wary allergic customer but baked into the bread where they would be totally invisible. Yet not only did the baguette not carry allergen warnings, it did not even carry a full ingredients list. That a business the size of Pret that sells hundreds of thousands of products a day could show such a criminal lack of allergen awareness is truly shocking. And despite the massive amount of negative publicity that they have received over the last week, according to a report in the Sun those baguettes are still on sale without any appropriate warnings. One can only hope that it will not just be allergy sufferers who will give Pret outlets a wide berth in future but many of those who have read the reports and have been shocked by Pret’s callous profit before care attitude. Any of you who follow Alexa’s YesNoBananas blog will know that the her family is very excited as three year-old Sydney who has a list of life-threatening allergies and intolerances as long as your arm (including, originally, egg, wheat, nuts, sesame, chickpeas, green peas and banana although bananas fell off the list some time ago) appears to have grown out of his wheat allergy. If you would like to follow the testing and new wheat assimilation-into-the-diet process, see Alexa’s posts Is it safe to eat wheat?, It IS safe to eat wheat! and Oh brave new world (and its pitfalls). However, her latest post, Addendum, or, I need a drink, flags up yet again how careful seriously allergic people have to be. Having discovered the M&S Made without Wheat range she was very impressed by the M&S allergen lists on their site and, after careful reading decided that the Supersoft white would accommodate all of Sydney’s remaining allergies. But, when she got to the shop the label on the supersoft white declared: ‘Not suitable for sesame allergy sufferers due to manufacturing method used’ while the warning on the identical loaf but this time sold without crusts – ‘Not suitable for barley and oat allergy sufferers due to manufacturing method used’. So, which is right? The label or the site? And anyhow, how could one of two apparently identical loaves made, presumably in the same factory, be a risk for sesame allergy sufferers but not the other? This is not really about rubbishing supermarket and manufacturer freefrom departments – in our experience many of them do actually try hard to accommodate allergic, coeliac and freefrom customers but – one has to be realistic. Freefrom and allergen-free foods remain a very small part of a supermarket’s business. So both the amount and the quality of the manpower they allocate to such things as updating on-site allergen lists is, on the whole, insufficient to ensure that the latter will always be update and entirely accurate. M & S make all sorts of disclaimers to that effect on their allergen lists page. So, while the lists are certainly useful to give you some idea of what suitable foods they might stock, they should never be used as a substitute for reading the ingredients label on the pack. And, if one is being totally realistic, one needs to realise that even the information given on the pack can be wrong – is it, for example, wrong on the breads Alexa was looking to buy in M&S? Although the number of serious allergic events triggered by foods that have been wrongly labelled on pack (as opposed to someone not reading or not understanding the label) are extremely small, the majority of ‘recalls’ in the food industry are as a result of packaging or labelling mistakes – the food put into the wrong pack or the wrong label applied – so mistakes can and do happen.